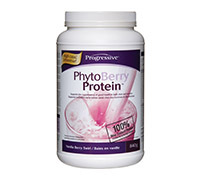 Each scoop of PhytoBerry Protein™ contains full servings of the original PhytoBerry® and Harmonized Protein™. Together they supply you with a nutritious shake that provides the antioxidant equivalent of 6 to 8 servings of fresh fruit, 24 g of New Zealand sourced protein and all the added support nutrients and co-factors. It truly is, the perfect way to start your day! Protein Blend (Non-GMO Soy Protein Isolate, Whey Protein Concentrate, Whey Protein Isolate), Agave Nectar, Cane Sugar, Inulin (Chicory Root Extract), Tapioca Starch, Almond Butter, Sunflower Seed Butter, Palm Kernel Oil, Soy Lecithin, Skim Milk Powder, Natural Flavour, SHAPE UP Cofactors: Freeze Dried Flax Oil Powder, Apple Pectin, Cocoa Fiber, Oat Bran, CLA, Green Tea Extract, Banaba Leaf, Citrus Aurantium, Magnolia Bark, Chromium Polynicotinate, Sodium.